This race is at Grimesthorpe Castle. There is the choice of 40, 70 or 100 miles on a 10 mile loop. 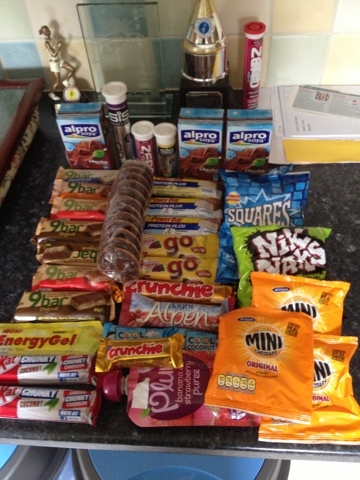 The plan was to use it as a steady training run for my 24 hour race in September. I don't do off road very much nor hills and this had both (although some people would call them inclines rather than hills). In the 2 weeks leading up to the race I was regretting entering as we were having boiling hot weather and also rain. Reports on face book were that there was going to be mud which I hate so I was not feeling the love. As it was a training run my taper consisted of a rest day the day before and just one run the day before that, there was no carbo loading apart from an extra packet of crisps before bed as I was hungry! Going into the race like this would make it harder but would be better training for the back end of a 24 hour race than going in fresh and carbo loaded. I was wearing my raid light waist pack which holds 2 x500ml water and has a big pocket for waterproof, first aid, phone and some food. There was also space for a 300ml bottle of water if I needed it. 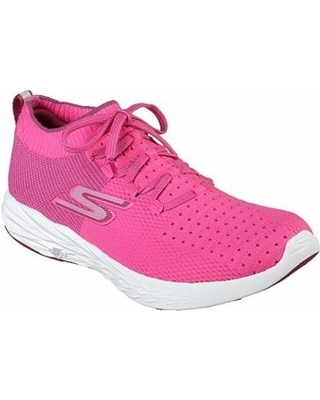 I decided to go start with my Skechers Gorun ride which are road shoes but had 3 others pairs of trail/road incase they were not suitable - they were the right choice 😃 even though muddy by the end. The race started at 9.30am, the first half mile was tarmac so I liked that but after half a mile we went off road up a long hill. After the first lap I would walk it whilst eating food I had picked up at the tent. I quite liked the route - a mix of tarmac and trail, some hills and some good views. There was one really nasty muddy bit of about half a mile. On the first lap I was passed by loads of people on this section as I was tip toeing around trying to keep my feet dry - they got a bit damp the first time but after that stayed dry. 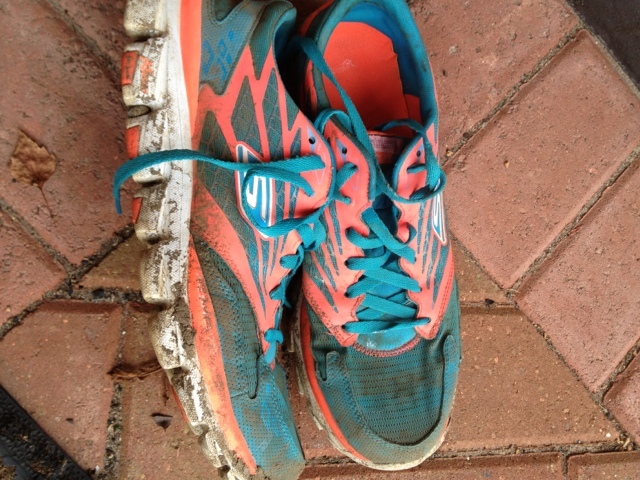 I was finding the run harder than expected - I have become soft doing tarmac and flat all the time! My pace was rubbish and it was just quite a slog yet still a long way to go so I was feeling grumpy. I was seriously thinking of stopping early - I thought that maybe 50 miles would be a good distance to do; stopping at 40 would just be too soon and would have been a total waste of money as I could have done a 40 mile training run without all the faff of hotels. So on that first lap I told myself that I could stop at 50 if I wanted to. I think the problem with ultras is when you look at the full distance it can be very daunting, you really need to just take it a lap at a time. So at 5 miles when I was fed up 70 miles seemed too far but 50 was almost bearable! At the end of the first lap I had not quite finished my 1L of fluid (one bottle high5 zero 1 bottle water) so I just filled both bottles, grabbed a 9bar from the food tent (as it saved me going to my tent) and was off again. As I walked up the hill I added a high5 tablet to one bottle and ate the 9bar. I had packed enough snacks in to get me through the first 20 so I didn't need to go to the tent after the first lap. Still feeling negative on the next lap but at least now I knew what to expect and if I was stopping at 50 then I would soon be 1/4 done! I think another reason for being negative was that I was getting passed quite a lot by other runners which never feels good especially early on. I was now walking all the inclines and any parts where there was a risk of turning an ankle. It was a warm day but not as hot as we have had lately, however, I was getting through a lot of my water now and had to stop myself from drinking otherwise I would run out. I had my last few mouthfuls when I saw the castle at the end of that lap. This time I went to the tent as 1L was clearly not enough. I had some 250ml bottles of Tescos diet coke (they only had diet in the small bottles) so at the end of all laps from now on I would drink one of those, they were lovely and cold - thanks Nick for cool box. I would then pick up some food and a 300ml bottle of water (which was small enough to go in my pack when I had finished with it, that gave me 1.5L per lap which I still found I had to ration out on all but the last lap. At 25 miles on the tarmac bit I checked my phone for the fist time and had a text telling me I was 6th lady and half an hour behind 1st. I had seen the start list and there cant have been many more than 10 ladies so I wasn't feeling very happy about that and thought oh well I'm only doing 50 anyway so at least I'm halfway! Shortly after this I started passing people. As there were 3 races going on I had no idea if I was moving up in positions. Passing people feels good so I finally started to feel more positive. End of lap 3 felt good as I might now be past halfway! I was still thinking of stopping at 50 miles or possibly 60. If I didn't slow too much then I could do 60 and still be done in daylight but 70 would mean most of a lap in the dark which I was not keen on. Phone check at 35 miles and I had moved up to 3rd lady so that felt good and combined with being halfway if I did it all improved my mood. The running wasn't getting any harder, legs felt fine, I was occasionally looking at pace and was slowing but not too much. At the end of lap 4 I found that Nick had dropped out, he was struggling with dehydration and swelling fingers. He said he would stop to the end so on the next lap I was thinking maybe after a few hours recovery he would be able to do the last lap with me, I would finish it if I was going to have someone to help me in the dark. So over the course of that lap I went from stopping at 50 or 60 to finishing the event!! I was continuing to have 1.5L per lap and only had my first wee after 41 miles. At the 45 mile phone check I was in 2nd, my phone battery was almost dead despite hardly using it. Was feeling very positive now - I might finish; I might have company for the last lap; I was gradually passing people and I wasn't feeling tired. At the end of lap 5 I asked Nick about running with me but he was not going to play. This threw me a bit but since I had told myself I was finishing it because Nick was going to run with me I just thought oh well will just have to suffer on my own somehow. I faffed around a bit to find my phone charger and whist I was at it got my headtorch ready for the last lap. On this 6th lap I took careful note of which side to go on the muddy section as that was the bit that worried me most and to avoid the mud you had to keep swapping sides! At the 55 mile phone check I was still 2nd so that was good, I was also still passing people and lapping others, no one was passing or lapping me until a few miles later when the lead man of the 70 caught me on my walk so I ran with him for a while. Tried to quick when I picked up my headtorch for the last lap as I wanted to make the most of the daylight. I thought it got dark at about 9.30 and if I didn't dilly dally I might mange to get through the muddy bit before it was proper dark. Ran some of the hills I had been walking but going into the woods after a couple of miles I needed to put on my headtorch as the light was fading. I still pushed on as best I could because any small amount of light was going to be helpful in the mud. By the time I got there it was dark but was not as bad as I expected. Phone check on the Tarmac at 65 miles and I was now 1st and 4th overall so that gave me a boost and I ran more of this than in previous laps - it was undulating so on previous laps I had walked the ups but in the dark it was hard to see the little ups so I ended up running them! 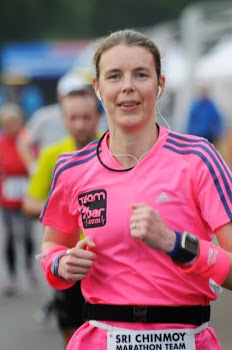 I was occasionally passing other runners but most the time was totally on my own which wasn't very nice as I was never quite sure if I was going the right way. There were occasional yellow arrows to show us where to go but not enough for my liking in the dark, I needed to see more to be confident I was going the right way. The last section of a couple of miles after the dibber was horrible as I couldn't see any yellow arrows or other runners. My sense of directions is terrible so having done the route 6 times was not enough to remember it. I was convinced I was going the wrong way and thought about going back but then thought I would get lost going back! Everything seems to look the same in the dark. Eventually I saw the castle which was such a relief and just headed for it. 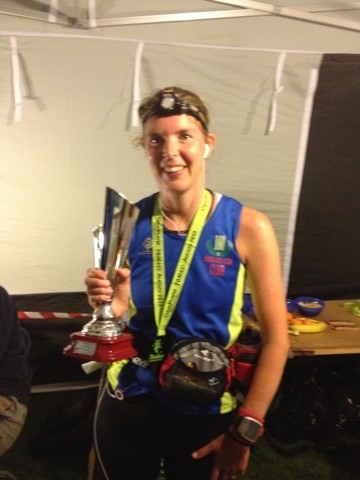 Finished in 13.27, 1st lady (an hour ahead of 2nd) and 4th overall. Not a particularly good time for the distance ( in my last 24 hour race I did 70 miles in just over 11 hours) but for me that was a hard course.